Tonight saw the final night of the November dates for the launch of the new Western Sands EP ‘Cut You Down To Size’ and which was just up the coast from their home town of Bournemouth so their fans were out in force to see them at The Joiners. First band of the evening were Kodah who are a local band. Having played a number of shows in the region over the past months it was a great opening band for a night of rock. Full of riffs and catchy tunes with songs such as Mad Day’, ‘Now You’re Leaving’ and ‘Hit And Run’ they certainly made a great impression on the crowd. With a packed set full of harmonies and epic guitar riffs, it certainly got the crowd in the mood to hear an evening of great rock. One Last Thrill were the second band of the evening who are from North Hampshire/Wiltshire and have been playing a number of gigs over the past few months. Vocalist Steph Whitehead had an outstanding voice that was felt throughout the crowd and it was a great set of guitar riffs and a sleek rhythm over powerful vocals with great harmonies. ‘Rotting Away’, Absolutely You’ and ‘Scream Out Loud’ all went down really well with the crowd. A number of their fans had made the trip down to see them and in a final song of ‘I Wanna Dance, a couple of fans who were there did just that with a very interesting and sometimes amusing routine becoming part of the set in their final song. Tonight though was all about Western Sand. This four piece of Tyler Hains, Jimmy Bradshaw , Findlay Hotchkiss and Nathan J. Kay have been making a name for themselves over recent years and with a recent slot at Hard Rock Hell and a just announced support slot for The Michael Schenker Group in December, the band were on excellent form tonight with their hard rock sound with a southern tinge. As soon as the set started it was riff after riff of epic proportions, with thumping drums and an addictive bass sounding backing the powerful vocals of Tyler. With a mixture of tracks from both their self-titled EP and ‘Cut You Down To Size’, songs such as ‘Dark Horse’, ‘It Ain’t Right’, ‘Two Rivers Meet’ and ‘Black Water Resolution’ was loud, full on and in your face rock and the crowd tonight loved it. Electrifying to watch, Western Sand gave it their all in front of a delighted crowd as ‘Broken Bones’, ‘Doin’ Me Wrong’ and ‘Free And Easy’ rocked not just The Joiners but most of Southampton such was the thundering sound this band make. To celebrate the launch of the EP and to get the crowd in the party spirit not only was free beer handed out to those in the front but also a number of drumsticks went into the crowd as well during Nathan’s mesmerising and fast paced drum solo. With the riffs just getting better and better with songs such as ‘Free And Easy’, ‘Welcome To The Badlands’ and ‘Cut You Down To Size’, Western Sand managed to turn the intensity of the awesome sounding rock up even more just when you thought it was at its loudest it could be, before ending the set on a real crowd pleaser of ‘Take Me Home’ which may have started more gently than some of their other songs but certainly ended in resonating around the venue in loud rock at it’s very best. An encore of ‘Going Down’ and a spectacular final song of ‘Nothing To Lose’ which was just riff after riff behind epic vocals brought a brilliant set from Western Sand to a close. 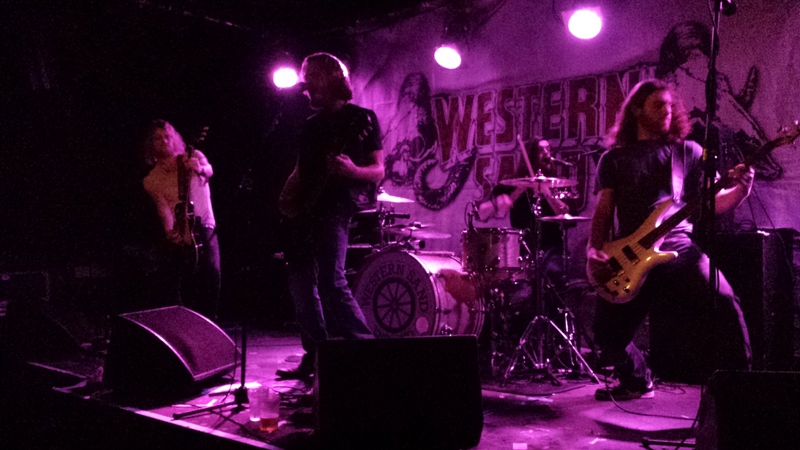 You can see why they are supporting legend Michael Schenker on his UK tour in December as Western Sand are definitely one of the most exciting bands to see live.